The Bolshevik coup d'etat was felt in Tobolsk and gradually changed the condition of our lives. In Spring 1918 the Imperial Family and entire suite were put on a diet of soldiers' rations. So, we found ourselves going from day to day in a set of conditions that we were not used to. We then found ourselves required to buy all the necessary provisions ourselves from the outside and have them sent to the house. Col. Kobylinski had access to private credit after the advance of credit from the government stopped with the fall of the Provisional government. Little by little, though, it became increasingly difficult to find credit with private people after early 1918. So it was that Prince Dologoruki, Gen. Tatischev, Gilliard and I all met together to look at the new circumstances which had arisen. We decided we had to reduce the number of servants. We dismissed some of the servants, paid them two months wages and their train fare. Then we met with the remaining staff and suggested to them that we all reduce our wages by a certain amount. Everyone agreed without exception. Some gave up their entire salary, others gave up half. Two days later those who we had dismissed left Tobolsk, the others stayed on for some time. 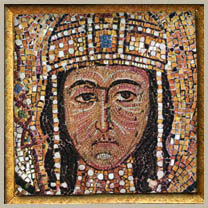 In the upper gallery of Hagia Sophia, in the special area reserved for the clergy, is this famous mosaic of the great Byzantine Emperor and his family - learn more .